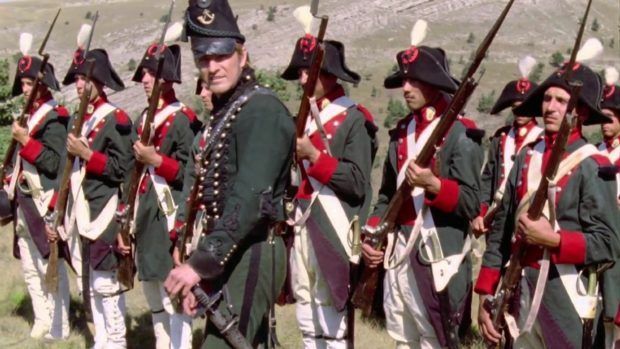 A Sharpe “superfan” has asked one of TV’s most famous riflemen to plant his colours in Angus for the first time. From over the hills and far away, 95th Regiment ‘Rifleman Harris’ has been enlisted for a spoken word event in Montrose on January 22. Local man Barry Graham, 56, said he has given Harris – actor Jason Salkey – his King’s shilling for a one-off oral history of how Bernard Cornwell’s epic novels were brought to the small screen. Mr Graham said: “I’m just a big fan of the series Sharpe. “I personally regard the series almost as an institution and of legendary status. “I think that it is a fantastic opportunity for the ‘lucky few’ to meet Jason and hear his fascinating insights and his personal experiences during his Sharpe” years with a question and answer session included. 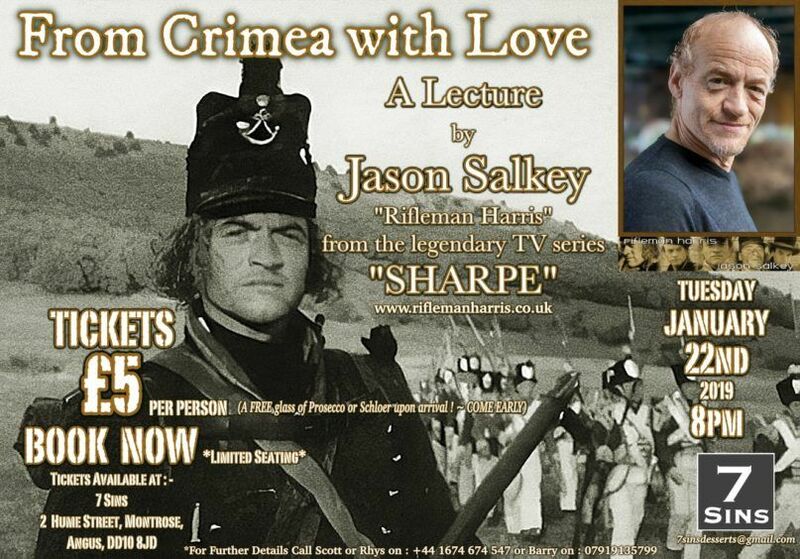 Salkey has written a new book ‘From Crimea with Love’ about his role in the Napoleonic TV movies alongside Sean Bean that changed his life forever. The series was shot mainly in Crimea in the rapidly disintegrated Soviet Union where Salkey and the crew went on to create one of Britain’s most successful and critically acclaimed television programmes. Mr Graham, who is an author, poet, composer and historical researcher, said Salkey got in touch through social media to enquire if he’d be interested in his upcoming book. He said: “I’m guessing he found me through his co-star, Daragh O’Malley, who is on my friend list. “I’m also a great admirer of John Tams who was rifleman Daniel Hagman and his music and have been privileged to have met him. “After some mutual messaging we have made a plan and I contributed £270 towards Jasons’s book in order to have the lecture in Montrose. “I will cover his expenses and try to offset some of them with a small £5 door charge on the night. Mr Graham and his late cousin John Molloy founded ‘The George Beattie Project’ and published a book of extensive research with regards history occurring in Montrose and St Cyrus around the ‘Napoleonic’ era. Salkey’s memoir promises to be an “eye-opening, jaw-dropping insider’s account” which will document the “mishaps, blunders, incompetence and downright corruption that made Sharpe’s Rifles go down in British television and film production folklore for its tales of hardship, disaster and chaos only rivalled by the Ukraine itself”. He will appear in Montrose on Tuesday January 22 at 7 Sins in Hume Street at 8pm with tickets on sale now. A rather splendid affair is promised when Whitby Steampunk Weekend returns next month at Whitby Pavilion. Considered by many to be the second largest Steampunk event in the UK – and certainly one of the friendliest – another exciting weekend is in store from February 8 to 10, with a number of activities, presentations and demonstrations lined up as well as the Steampunk Retail Emporium. The event features a special guest appearance from actor Jason Salkey, most well-known for playing the educated rifleman Harris in the Sharpe series alongside Sean Bean. He also starred in the movie About a Boy. Tapping into his written diaries, photo journal and video log, Salkey brings you an eye-opening insider’s account of one of the best-loved shows ever made. An audience with Jason is on at Whitby Pavilion on the Saturday and Sunday, 1pm, advance tickets £5. One of TV’s most famous riflemen has told how Angus could provide the perfect backdrop for a Sharpe reunion with Sean Bean. Jason Salkey, who played 95th Regiment ‘Rifleman Harris’ in the Napoleonic War-set drama, was speaking in advance of of his arrival in “God’s country” next week for a spoken word event. Local man Barry Graham, 56, gave the actor his king’s shilling to bring Salkey to 7 Sins in Montrose where he will speak to the “chosen few” about how Bernard Cornwell’s epic novels were brought to the small screen. Mr Graham and his late cousin, John Molloy, founded The George Beattie Project and published a history book containing extensive research on events occurring in Montrose and St Cyrus around the Napoleonic era. “I had no idea Montrose and Angus had such as Napoleonic history and I will be intrigued to find out more,” said Mr Salkey. “But I shouldn’t be surprised as some of Wellington’s most fearsome and effective troops came from north of the border. “As long as there is room to march off over the hills and far away then I’m sure Montrose would do just find as a backdrop for more Sharpe adventures. “Of course they already did a comeback with the Indian Sharpes some 10 years after Waterloo was aired. “As my character was brutally hacked down by the producers – I mean the French – at that decisive battle, I will never pull the on the green uniform on screen again. “There is one book they could conceivably do which is Sharpe’s Devil, where Sharpe and Harper sail to South America to help Blas Vivar suppress a rebellion in Bolivia or somewhere? “On the way, they stop off at St Helena and meet Napoleon. “The trouble is the story is set five years after Waterloo – therefore Sharpe and Harper showing up as fat, old, grey geezers would make the audience wonder how they could have aged so much in just half a decade. Mr Salkey has written a new book, From Crimea with Love, about the role alongside Sean Bean that changed his life forever. The series was shot mainly in Crimea, in the rapidly disintegrated Soviet Union, where Mr Salkey and the crew went on to create one of Britain’s most successful and critically acclaimed television programmes. Mr Salkey said fans can expect a “humorous, often shocking but always engaging skip through the twists and turns of the making of one of Britain’s most loved TV shows”. “It’s true that I have never been up Montrose way before, therefore after more than a half century on this earth I thought it was about time. “And when Barry told me there were many Sharpe appreciators up his way that would love to hear about my story of the making of the show the plan was hatched. “Aside from some of the most beautiful scenery on offer in the UK – it is God’s country after all – I like the look of the museum at the airfield. Mr Salkey will appear in Montrose on January 22 at 7 Sins on Hume Street at 8pm, with tickets on sale now at the venue.